Since the beginning of November, I have participated in a course about 2D graphics. It has been very interesting and in some ways challenging as well. Getting back into the habit of sketching a little each day has been great, as well as the opportunity to do life drawing once a week. During the first part of the course, we recieved two different game concepts from which we got to choose one, and then we were assigned to draw 20 different character sketches for the chosen concept. I chose the concept Clash of Heavens 2. Out of the sketches, we then got to choose one character to refine, and to take through different production stages including construction, line art, and lighting during the rest of the course. 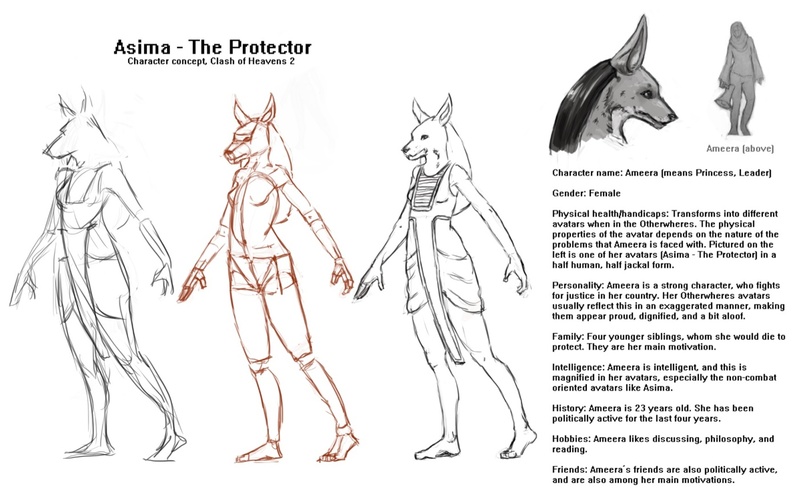 Here follows a short presentation of and thoughts about my chosen character Asima the Protector, together with a construction sketch and a character turn-around. "I picked the jackal head character Asima because I liked the silouette the jackal head gave her. It felt interesting and easily recognizable for potential players. 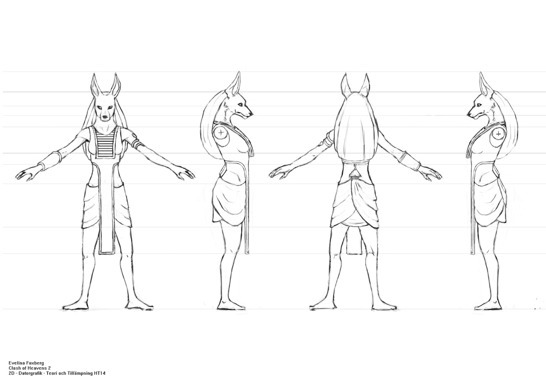 I liked the idea that this and other Egyptian characters in the game would appear a little bit aloof and dignified, and I felt like this would be easily achiavable with this character without too much costume detail to distract from her powerful pose. I wanted to keep her design simple, and also make her to appear strong enough not to need too much accessories. 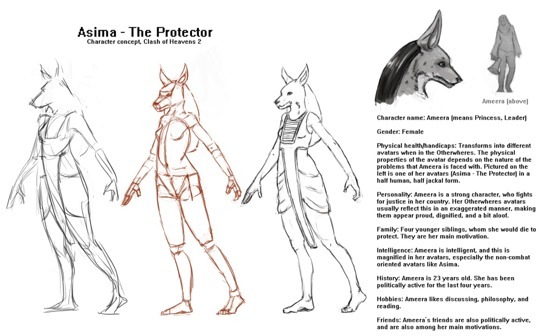 The fact that Asima has a jackal head makes her stand out, and makes it evident that she is more than a human, which is also something that I wanted to achieve. It also brings a sense of eeriness and intelligence to the character, which goes well with her intended purpose as a ”thinker” character rather than a combat-oriented one. 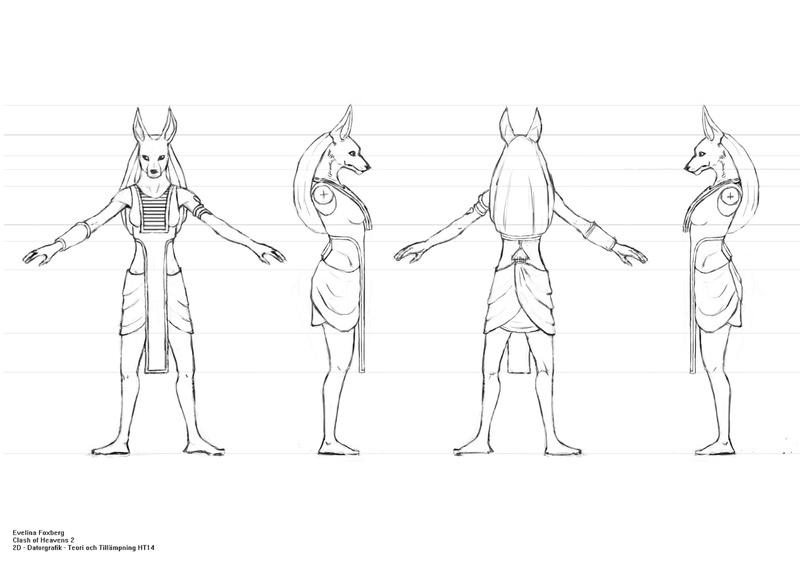 I wanted to make the egyptian influences quite obvious on this character, as she is one of several playable "Otherworld" avatars for the character Ameera, who also originates from Egypt. I got a lot of inspiration from the egyptian god Anubis. I also added a line pattern to Asima's jewellery, and made it very angular to fit the style of old egyptian paintings. A snake bracelet was added to symbolize cleverness, and a big bracelet on the other arm to show how powerful this character is. The clothes of the character were inspired by egyptian clothes on old paintings, and deliberately kept clean and stylish not to distract from her pose. I wanted my character's pose to signal confidence and dignity, which is why I chose to make it open, with her head held high and arms stretched out to the sides - comfortable with taking up space."